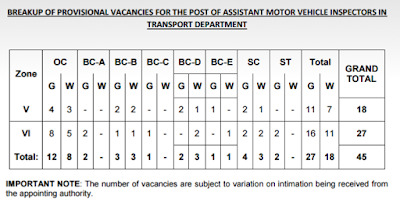 Telangana Public Service Commission Applications are invited Online from qualified candidates through the proforma Application to be made available on Commission’s www.tspsc.gov.in to the post of Assistant Motor Vehicle Inspectors in Transport Department. iv. The Examination is likely to be held on Dt. 08/11/2015. Educational Qualifications: Degree in Mechanical Engineering or Automobile Engineering or any equivalent qualification or not less than 3 years and possess Heavy Transport vehicle endorsement. Fee Particulars : Remittance of Fee Rs. 100/- + Online Application RS.120/- , Fee exempted Category : SC, ST, BC & Ex-Service Men. vi). 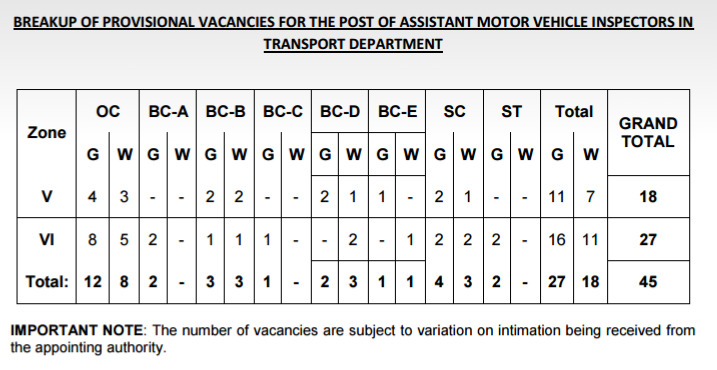 Motor Driving License as prescribed under Educational Qualifications.